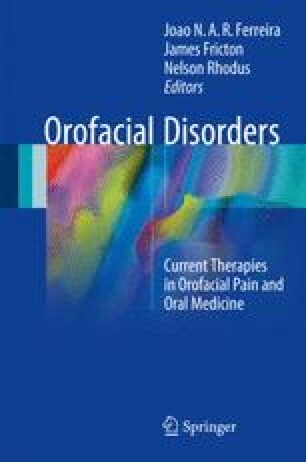 Oromandibular movement disorders have the potential to impair jaw function; affect orofacial expressions, facial appearance, and aesthetics; and impact on the quality of life of affected patients. A dentist trained in orofacial pain or oral medicine plays a primary role in the diagnosis and management of orofacial movement disorders. As dental awareness increases in the aging population, the importance of adequate knowledge of these clinical entities by the orofacial pain and oral medicine dental specialist becomes more important. The responsibility for recognition of movement disorders is also that of the general dentist as well, in order to provide appropriate treatment based on an accurate diagnosis. It must be kept in mind that due to the lack of methodologically sound studies supporting the various available therapeutic options, the importance of conservative and noninvasive restorative modalities for maintenance of an orofacial functional equilibrium is reinforced. This chapter will review the more common oromandibular movement disorders and treatments. National Institute of Neurological Disorders and Stroke. http://www.ninds.nih.gov/disorders/dystonias/detail_dystonias.htm. 2016.